The Astoria Tiffany 2 light floor lamp in a geometric Art Deco design, a striking and detailed lamp standard, with an intricate inlaid base and ribbed detailed stem, finished in dark antique that is almost black, with a dark metallic sheen. The large 48cm Tiffany shade has a pearl white base colour and strong contrasting iridescent shades of blue, purple and charcoal inset into a dynamic geometric design that glistens like oil on water. Inlaid clear textured glass panels will sparkle when illuminated. Fitted with two pull chain switches so that you can have one or both lamps lit to suit your mood. A 48cm diameter full sized floor lamp standard that will become the centre piece of any in an Art Deco themed home. A wonderful dynamic Tiffany lighting design hand crafted in the traditional manner using age-old soldering techniques. 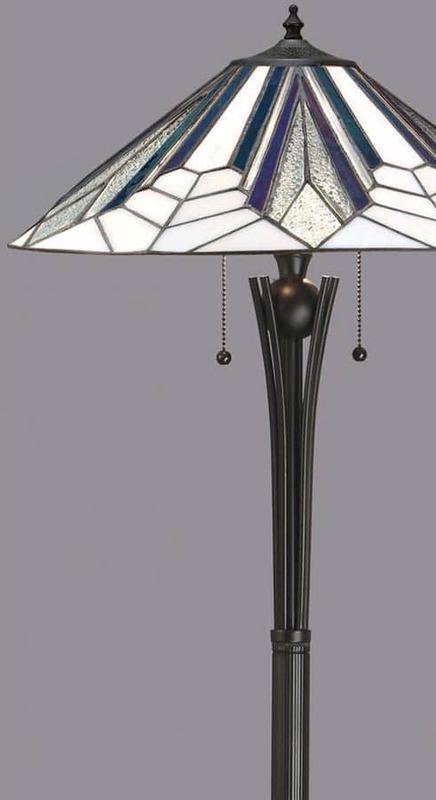 This is a hand-crafted Tiffany floor lamp and the shade colours may differ slightly from the image shown, as each piece of glass is hand-made and may differ slightly in colour or shade. This should not be seen as a fault, rather something that makes each Tiffany shade unique.